I decided to have some fun with this weekend with my video camera.. A bit shaky to start with but watch this space! Signed up for a day of VMCC sprinting at Wroughton airifield in Wiltshire, I was keen to give my father’s German 250 Sportmax Replica a chance to impress down the main runway. The first time I ever set eyes on it, I was in short trousers and the bike in basket case form, just another bag o’ bits in Dads garage, I thought. About a year later and with the help of undisputed NSU specialist Harold Nuttall, there sat the compact, well engineered pocket rocket complete with handmade aluminium tank and recognisable forks. Early attempts at running the Sportmax Replica were mainly unsuccessful. Partly due to the rain that seemed to fall on every occasion we tried to start it. Running a 6V battery for ignition and a racing spark plug, the rebuilt engine was reluctant to say the least. Following a recent tune-up by it's creator Harrold, the dinky race bike fires up every time. Arriving at disused airfields such as Wroughton, just south of the M4 near Swindon, I find there is always a sense of nostalgia of a time when such barren areas were clearly hives of activity. The modern day VMCC sprints are a great way for a relative notice, like myself to enjoy and use a period race bike in the safest possible way, on a huge dis-used airfield. With no need for a full competition licence, the VMCC will allow you to pay for a day licence in order to compete. Following scrutineering, there was an almighty long wait whilst a new mode of timing gear was tested. In tune with the friendly atmosphere of the whole event, a vote was taken by the competitors to switch back to the original timing gear at the expense of a few hours action on track. After a few hours wait in the now glorious sunshine and once initial tests were carried out, who else but Henry Body should be first up to the start line to give the tried and trusted set-up a once-over. Nevermind how many times I’ve watched this man sprint his pre-war Douglas dirt track bike, it never ceases to amaze me. For more images visit my Photobucket gallery. Here's me heading down the 1/4 mile at Wroughton Airfield..
And at the Eelmore Twisty Sprint.. 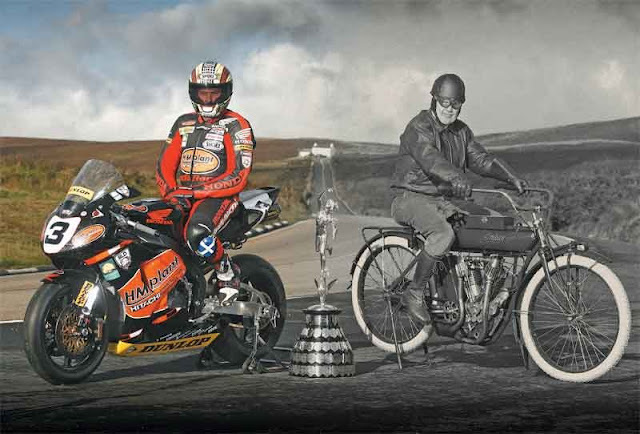 Fantastic shot to promote the TT Races Mountain Course Centenary which kick off in June 2011.